I am a little “old-fashioned” about computer games for kids. I worry that it becomes easy for we parents to use electronic devices as baby sitters, until we suddenly realise one day that our kids have not played outside, or created a rocket ship with that big cardboard box. Instead, they are almost reliant on screens for a LOT of interactivity. Like most things in life, I believe it’s about balance, about looking for the games and apps that can be used to create with, about making sure we play WITH our kids, and yes, of setting limits on the time our kids and ourselves spend with screens. 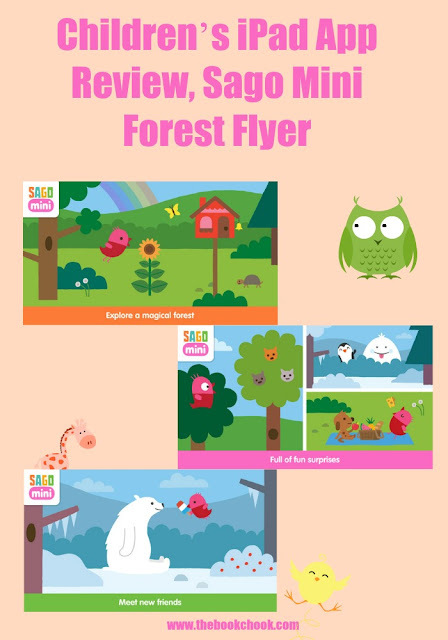 I took Sago Mini Forest Flyer for a flap to see if it’s an app that kids can create with. It is! Fun will definitely be had as youngster’s invent back stories and current stories and future stories for a cute bird named Robin. What I loved: One great thing about Sago Mini Forest Flyer is that it encourages parents to follow Robin’s journey WITH their kids. It gives suggestions (in parent section) of activities and questions to guide youngster’s play and help them get maximum benefit from the app. There is certainly much potential for creating stories and doing lots of forest exploration. The art work is lovely - clear and colourful. The animations are cute and there’s a real sense of fun and whimsy too. The app is not free, but at around the price of a take-away coffee, it seems reasonable to me. I think kids 5 and under, and their parents, will enjoy roaming with Robin. Slightly older kids will too, for a while, but it’s probably best for little ones. Also, you can check out my iPad App Reviews on Pinterest, and find more apps and articles via my Listly page.